I've had real trouble finding the words to begin writing about this bookshop, starting and stopping several times since my visit. Not because I didn't like it – I did, very much – but because of the confused emotions it evokes from a personal point of view. On the one side you've got a new bookshop, opened relatively recently and offering a particularly fine collection of secondhand – mostly first edition – books I've often dreamed about encountering. But on the other you have the location of a now closed bookshop which had a great amount of sentimental love. I therefore hope both the bookshop and bookshoppers old and new will understand and appreciate my words regarding this week's destination. Yes, I'm sad the old venue is no longer with us, but life goes on and change is an important part of that. The building is still a bookshop, and were I to have 'met' Tunbridge Wells a few months later I wouldn't know any different. So with no disrespect to the previous incarnation it is with this attitude that I approach Hall's Bookshop in Tunbridge Wells. 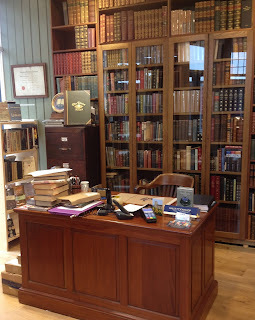 The first thing to note is that this is a bookshop of contrasts: traditional dark wood bookcases line the shop, with modern, light wood shelves fitted in the middle of the room; classic older fiction is interspersed with newer releases; and a modern wooden floor is contrasted with a beautiful antique desk that it would be wrong to refer to as the till. Books are 95 per cent first editions, with the random selection I picked out ranging from about £9-£25, which is probably a perfectly acceptable price range for the town. As a poorer inhabitant even I seriously considered taking home a £20+ favourite by Iris Murdoch, and another shopper happily spent £9 on what he said was a holiday read. 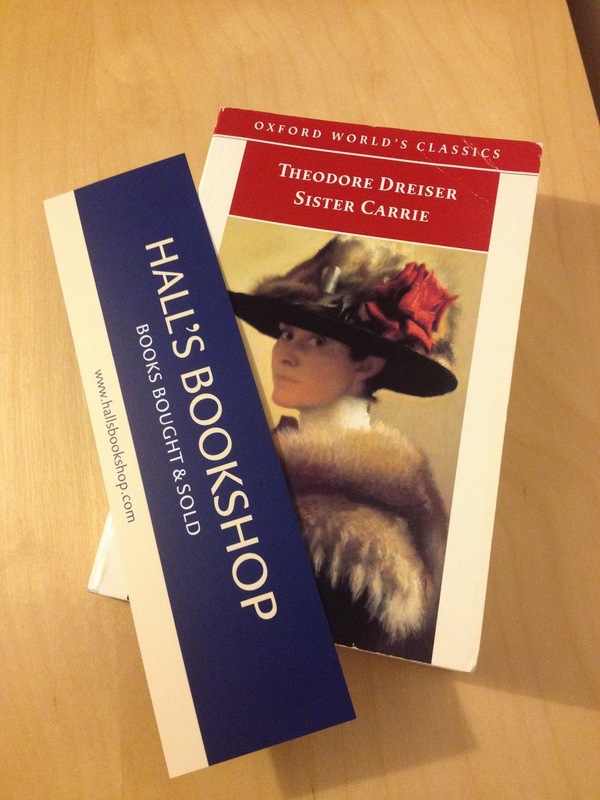 However, if those prices aren't to your liking, standard paperbacks can be found on a couple of bookcases, which is where I stumbled across Theodore Dreiser's Sister Carrie. A title I'd culled from my shelves a few months previously without reading and regretted the loss of ever since, it seemed the more sensible purchase given the current state of my finances. Had I been feeling flush, a trip to the first floor Adrian Harrington Rare Books could've easily emptied my bank account of a couple of hundred pounds. Especially because I found a selection of perfect condition Edith Whartons and Elizabeth Gaskells I've long wanted to read. But as I saw that floor as technically a different bookshop it's a blog and buy for another – more affluent – time. A time when I'm hoping the basement gallery will also have been completed to enable me to explore the rest of the building. Returning to Hall's proper, it was remarkably lively. During my browsing a range of customers visited, including one (purchasing) family that had me almost hyperventilating as their 'enthusiastic' child ran around removing random titles from the shelves and putting them on the floor. 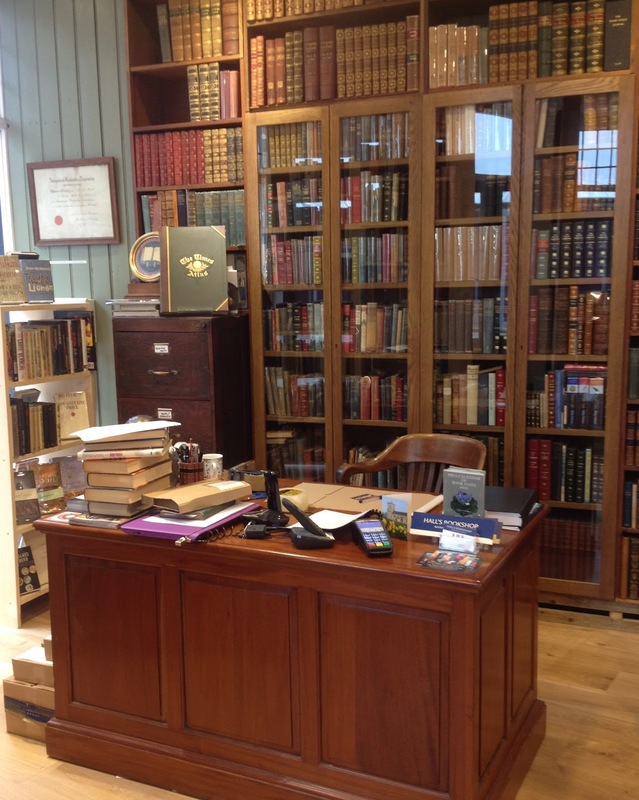 No damage was done and the family did replace every book, but I couldn't help but marvel at the bookseller's calm as he served customers and answered the family – and child's – questions without even batting an eyelid. I know this will be good for the child's long-term engagement with bookshops but had I been more than a silent observer it would've been hard not to rush to the books' rescue. The reason for diverting to that story is not to moan about hyperactive children but because, to me at least, it emphasises inclusivity: the young are as welcome as the grown up. Which is exactly how I feel about the new Hall's Bookshop in relation to its much-loved ancestor. Brilliant! I know *exactly* what you mean. No burrowing here, but the old and new simply aren't comparable in anything other than brightness - you're right, it is a lot brighter now. With ref to children, they were unbelievably patient and kind to Alec (aged four) when he went into enquire about a Star Wars book in the window. They held it for him until he was able to come back with his pocket money, and even let him negotiate a lower price. I can't tell you how much it meant and he was thrilled! Oh! How good of them. I love stories like that as a way of reminding people why bookshops are great. I hope he enjoyed the book?